Working on a friend's 1995 4/4 Zetec I noticed some drops of liquid on the top of the transmission cover. 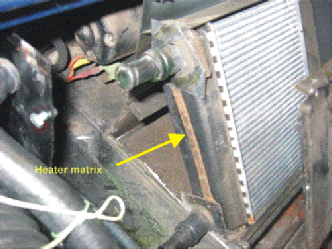 Closer examination revealed coolant under the lower edge of the heater unit. 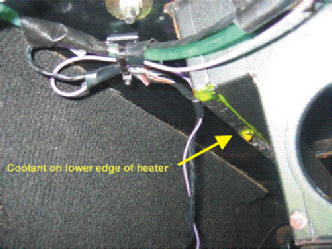 Here are the steps to removing and replacing a faulty heater matrix. This was a 1995 4/4 Zetec engined car - I don't know which other Morgans have the same setup. The consequences of a leaking heater matrix are obvious - coolant in cabin, soggy carpets etc once the leak gets worse but here's what can happen even with a slight leak. The original Pioneer radio was dead thanks to coolant penetrating the electrics and with the help of electrolysis corroding pretty well everything. 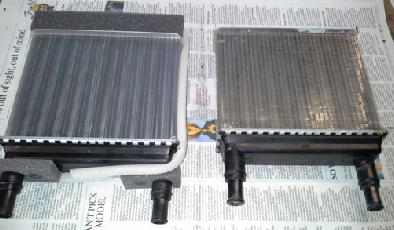 Once the top of the heater unit was removed it became clear that the heater matrix itself was built into the whole heater unit before it was installed in the car. The choice: either remove the complete heater unit (huge job - bonnets off, moving lots of parts, unbolting unit from car) or modifying the unit to enable convenient removal and replacement of the heater matrix. In consultation with the owner we decided to modify the heater box by slicing off the panel which holds the heater matrix in place. 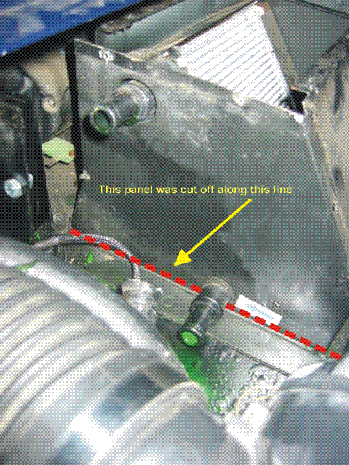 Making sure all hoses, wiring etc were well out of harm's way a air-powered cut-off wheel similar to that pictured left was used to slice along the line indicated in the illustration. The exposed matrix was then able to be removed. I tested by immersing in water and applying air pressure into the unit which showed a very slight leak under the plastic top just near the lower connection. Being an aluminium/plastic unit we established that a repair couldn't be guaranteed and so elected to buy a new unit. The factory did have the matrix in stock but having established the matrix is identical to a Lotus Elise S1 we bought one from www.eliseparts.com in the UK. It arrived in Australia 5 days later and total cost landed was less than AU$200. This pic shows the new matrix on the left and the old one on the right. The identical unit from Lotus in Australia would have been $800!!! The new unit was an exact fit and once in place the modified side panel was replaced using black butyl mastic as a sealant. Before replacing the heater top the hoses were reconnected and the engine run up to temperature to make sure no leaks were evident.